This 3 days/2 nights tour allows you to experience some of the most popular places in central Japan in a short amount of time. The tour takes you from Tokyo into the heart of old picturesque Japan, where you can spend a couple of days immersing in its traditional lifestyle. Your first stop is Mt Fuji (11:20 am - 12:00 pm). Upon arriving at Mt. Fuji 5th Station, spend the following 40 minutes discovering and soaking in the breathtaking views of Japan. 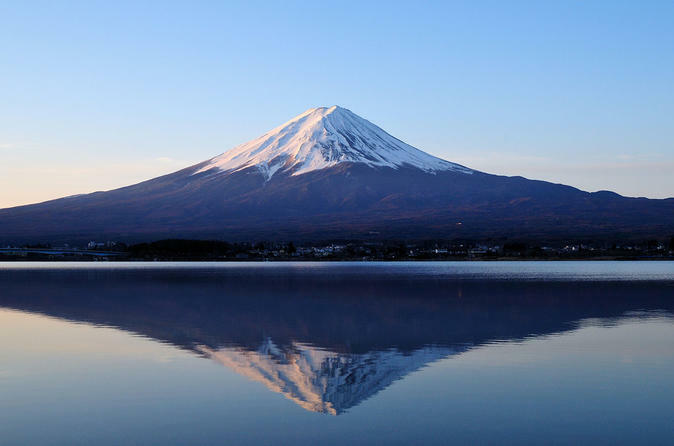 A well known symbol of Japan standing at 3776 meters high, the spectacular Mt.Fuji has made the subject of literature and art throughout Japanese history. After a relaxing lunch at Lisa & Gaspard Restaurant in Fuji-Q Highland (12:50 - 1:40 pm) make a stop at Lake Suwa Observatory, which is the place where the story of the popular animated film "Your Name" ("Kimi no Na wa") was set. The final stop of the day is Takayama (ETA 7:10 pm) where you will be spending the night. Start the day walking around the Takayama Morning Market, where you can enjoy a wide variety of delicious and creative local specialties, such as freshly squeezed orange juice served in orange peel cups or freshly brewed coffee in cookie cups. Enjoy a leisurly day exploring the area at your own pace, or join a 1 Day bus tour (10:20 am - 4:10 pm) that will take you Shirakawago, a World Heritage site with Gassho style houses said to have stood for over 300 years (*Option 1). The village was once considered a wild and unexplored region, with a natural environment that limited the interaction with neighboring areas. This made for unique cultural practices and lifestyle, all which can still be experienced today. Depart from Takayama Station (8:45 am) and head to a Japanese Sake brewery, where you can experience the makings of traditional Japanese Sake, whie also delighting your tastebuds. Make a second stop at Lake Suwa Observatory, before heading for Lake Kawaguchi. Spend a relaxing afternoon by the lakeside or embark on an adventure into old Japan with the Ninja Experience private tour (*Option 2). The tour takes you to the small village of Oshino, where you can revel in the historical and traditional beauty as well as the untouched nature surrounding the eight ponds area (Oshino Hakkai). The clear spring water in the ponds comes from snow melt from the slopes of nearby Mt.Fuji filtered down the mountain and it hosts a large variety of fish and plantlife. At the end of the three day tour, where you will be dropped off at either the Metropolitan Government Office parking lot in Shinjuku, Tokyo (ETA 7:10 pm), or the Sunshine Hotel in Ikebukuro, Tokyo (ETA 7:35 pm).